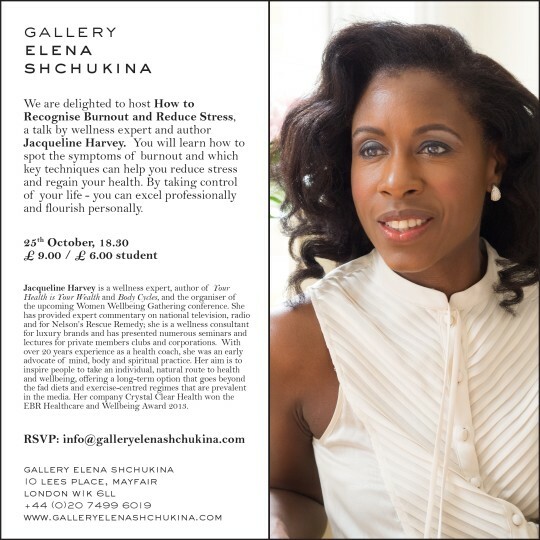 We are delighted to host How to Recognise Burnout and Reduce Stress, a talk by wellness expert and author Jacqueline Harvey. Professional burnout is experiencing chronic stress at work. Left unchecked, it can wreak havoc on your health, happiness, relationships and job performance. In order to catch burnout and combat it early, it’s important to know what to look out for. You will learn how to spot the symptoms of burnout and which key techniques can help you reduce stress and regain your health. By taking control of your life - you can excel professionally and flourish personally. Jacqueline Harvey is a wellness expert, author of Your Health is Your Wealth and Body Cycles, and the organiser of the upcoming Women Wellbeing Gathering conference. She has provided expert commentary on national television, radio and for Nelson’s Rescue Remedy; she is a wellness consultant for luxury brands such as Ferragamo, Valmont and Quintessentially, and has presented seminars and lectures for both private members clubs and corporations. With over 20 years experience as a health coach, she was an early advocate of mind, body and spiritual practice. Her aim is to inspire people to take an individual, natural route to health and wellbeing, offering a long-term option that goes beyond the fad diets and exercise-centred regimes that are prevalent in the media. Her company Crystal Clear Health won the EBR Healthcare and Wellbeing Award 2013.